Travels in Arabia Deserta - Charles M. Doughty 1888 - At The University Press, Cambridge - First Edition	A superb and thus scarce two volume first edition of what Howgego describes as ‘one of the great classics of travel literature’, an ‘unrivalled encyclopaedia of knowledge about all aspects of nineteenth-century and earlier Arabia.’ (Oxford DNB). Profusely illustrated throughout with plates (many folding), sketches, maps and diagrams, together with large and magnificent folding colour ‘Sketch Map of Itinerarium of part of North Western Arabia and Negd’ in pocket at rear of volume 1. Housed in a bespoke matching green morocco and cloth clamshell case by Sangorski & Sutcliffe, spine lettered in gilt, enclosing two separate green cloth chemise. ‘I have talked the book over with many travellers, and we are agreed that here you have all the desert, its hills and plains, the lava fields, the villages, the tents, the men and animals. They are told of the life, with words and phrases fitted to them so perfectly that one cannot dissociate them in memory. It is the true Arabia, the land with its smells and dirt, as well as its nobility and freedom. There is no sentiment, nothing merely picturesque, that most common failing of oriental travel-books. Doughty's completeness is devastating. There is nothing we would take away, little we could add. He took all Arabia for his province, and has left to his successors only the poor part of specialists. We may write books on parts of the desert or some of the history of it; but there can never be another picture of the whole, in our time, because here it is all said.’ - T. E. Lawrence	Doughty set out on a camel journey to Maan and Petra. Here he heard tales of other rock-monuments unseen by western eyes, at Medina Salith on the pilgrim road to Medina, and he determined to explore them, and proposed a survey of the Wadi Arabah region as a second object of his expedition. At Damascus, however, Doughty found the Turkish Authorities unwilling to let him join the Meccan pilgrim caravan; and the British Association and the Royal Geographical Society declined to aid him. So rebuffed he decided to enter Arabia at his own risk and charges. His original plan, however, was modified: instead of returning northwards from Medain Salih, he would join the Bedouin and live with them as a wandering physician. Adopting the name Khalil and the dress of an Arab Christian, he settled down at Damascus for a year to learn Arabic. In November 1876 he slipped out and quietly joined the pilgrim caravan. The journey led Doughty from Medain Salih to Hail, Kheybar, and the Kasim in central Arabia: it ended twenty one months later, on 2 August 1878, at Jiddah on the Red Sea. The unique value of his journey began with its second stage, when, alone with small funds, and stubbornly proclaiming himself an Englishman and a Christian, Doughty had to endure not only the fatigue and privation of desert life, also, in a measure spared to those travellers who have enjoyed powerful support or gone in disguise as Moslems, the suspicion and occasionally the violence of the Arab society to which he had entrusted himself. In these circumstances of difficulty he gathered a vast amount of new information about the geography and geology of north western Arabia, being the first to record accurately the true direction of the great watercourses of Wadi Hamd and Wadier Rumma. Of still greater value was the understanding that he gained of Arab Character and the conditions of nomad life. In these respects his contribution to western knowledge of Arabia was the greatest that had yet been made; and the acuteness and the wisdom his observation made him the acknowledged master of all later travellers. Doughty reached England at the end of 1878, broken in health by his ordeal. Continued weakness delayed publication of his results, his paper being printed in the Proceedings for July 1884. Doughty went to work on a fuller narrative, designed not only to be a faithful record of all that he had learned or suffered in Arabia, but the vehicle of his first experiment, During the First World War Lawrence a passionate devotee of the great Arabist C.M. 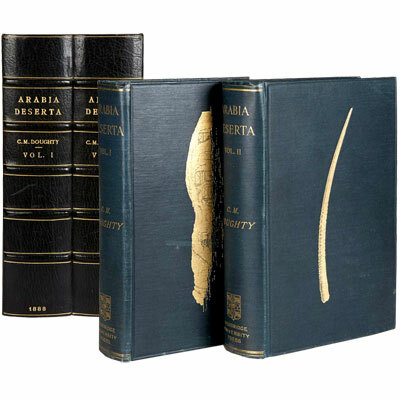 Doughty, had tried to persuade the government to issue parts of Travels in Arabia Deserta as a handbook for officers serving in the Near East. He was instrumental in getting the Second English Edition published by the fledgling firm of Jonathan Cape in conjunction with the Medici Society. Provenance: From the library of noted discerning collector H. Harvey Frost (1873-1961), with his bookplates. Frost assembled a remarkable collection of manuscripts in less than a decade; failing eyesight led to the dispersal of his library from 1952, chiefly by Maggs of London. References: Macro 859. Howgego, Continental Exploration 1850-1940, D29. Henze II, 88. NYPL Arabia coll. 166. Fück 198.